Eduardo Navarro explores different levels of perception and forms of changing reality and time. At times, his work fits into the delicate relationship between art and the spiritual. At others, the artist uses apparatuses and information from the field of science. Thereby he leads the public into a kind of trance through mental states that explore non-rational forms of communication, going beyond verbal language. Navarro seems to test the transformative potential of art, creating situations where behavior, ways of thinking, and belief systems are put to the test or driven to exceed their limits. 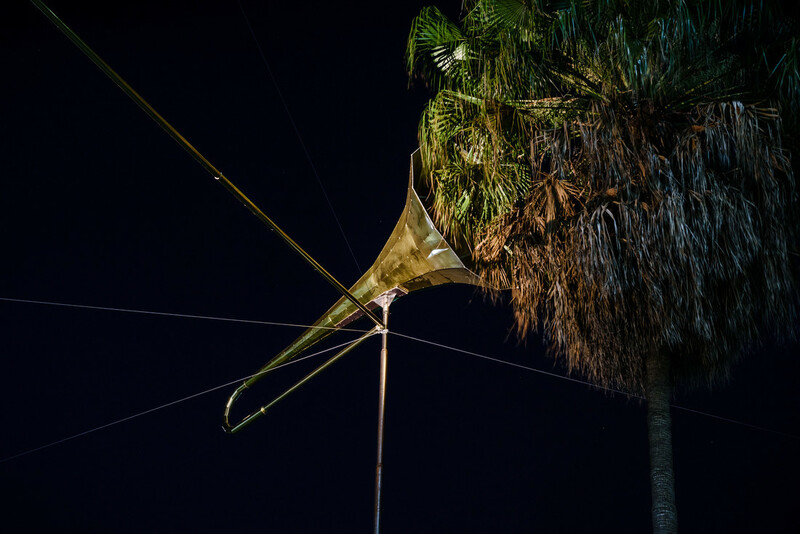 Sound Mirror (2016), presented at the 32nd Bienal, is a kind of instrument built to acoustically connect a palm tree, located outside the Bienal Pavilion, to the exhibition space. The plant and the visitors are placed in equivalent positions, in a sonorous exchange that challenges the meanings of communication and listening. Navarro’s work points to an emotional technology capable of making us reflect on the connections that art triggers through the permeable relationship between living beings, the artist and the audience, the actors and the objects of art.